Black and white negative of a photograph of a cylindrical water tower. There is a fence around the bottom of the water tower. This water tower was built on the east side of Euclid Street, north of Dundas Street, in 1904. It served until the second water tower was built in Kinsmen Park in 1947. 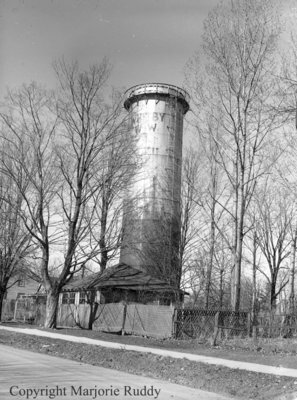 This water tower was demolished in September 1950. Old Water Tower, March 24, 1948, Marjorie Ruddy. Whitby Archives A2013_040_999.